Birmingham, Ala. (2 April 2019) The 2019 Battery Tender ® Global Mazda MX-5 Cup presented by BFGoodrich Tires ® season will stage rounds three and four of the championship this weekend as part of the NTT IndyCar Series return to Barber Motorsports Park. The weekend will feature a double-race day Saturday for the Global Mazda MX-5 Cup field, which has 30 entries slotted for the duo of 45-minute races that will both be streamed live on www.mazdamotorsports.com. 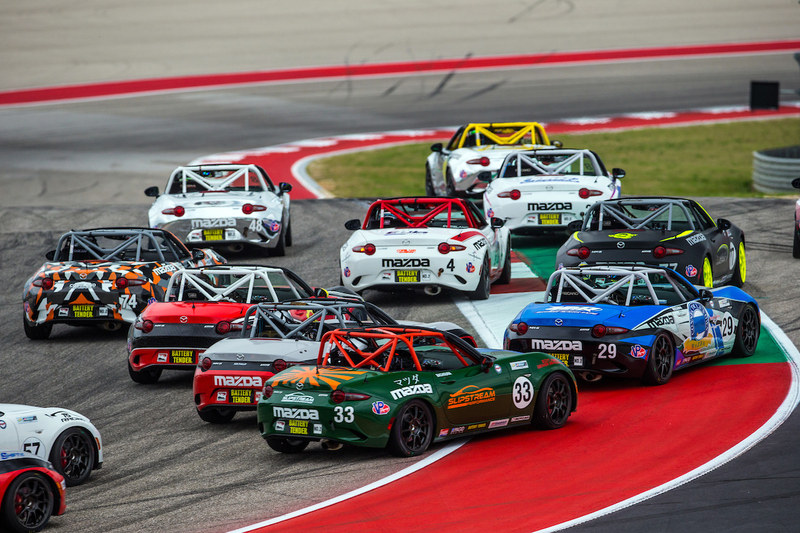 The Alabama event is the second Global Mazda MX-5 Cup race weekend of the year, with the series launching the 2019 season with two outstanding races at the Circuit of the Americas. The opening rounds saw nearly 500 passes made in the two races, with Drake Kemper (No. 99 Sick Sideways Racing) claiming victory in race one and Selin Rollan (No. 87 Sick Sideways Racing) taking his race two win with authority. With a large and closely-matched field, a track that has delivered a lot of action in years past, and a large prize on the line for championship performances, the Barber Motorsports Park event has a number of storylines to follow. Patrick Gallagher won both Global Mazda MX-5 Cup races at Barber Motorsports Park on his way to the 2017 championship. Nikko Reger won both Global Mazda MX-5 Cup races at Barber Motorsports Park on his way to the 2018 championship. Sense a theme? Barber, which hosted the opening two rounds of the 2017 championship and was second on the schedule in 2018 and 2019, has shown to be a king maker when it comes to the championship standings. Kemper rolls into town with a narrow seven-point advantage over Rollan (56-49) as he hopes he can stake his own claim towards the championship with a big weekend in Alabama. Kemper’s double-podium performance at COTA means that he’ll arrive at Barber Motorsports Park as the championship leader. But unlike a lot of his competition, this will be his first ever visit to the track and he hopes to be a quick learner. He’s prepared for the weekend by watching previous MX-5 Cup races on You Tube. "It's always exciting to come back to Alabama to race because I have so many family and friends who come out to support me,” said Sparks. “There's so much visibility racing with IndyCar it's a great event to have them come out. To battle up front at Barber, we need to not lose the draft and keep the pack tight. Fans can expect to see some exciting racing from John (Dean II) and me." 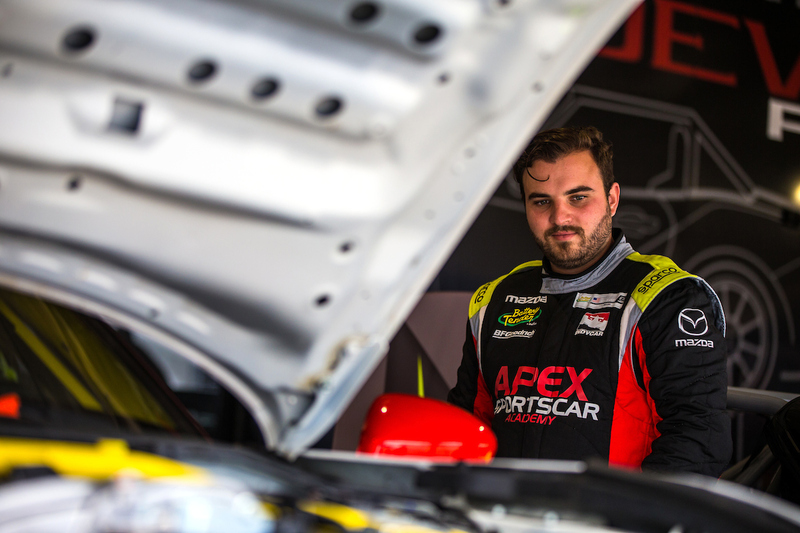 Having raced to 4th in the 2017 Global Mazda MX-5 Cup championship, and then backing that up with his runner-up result in the 2018 championship, there is little doubt about where Bryan Ortiz (No. 4 Copeland Motorsports) is targeting in 2019. With a run to second in race one and then fifth in race two at COTA, Ortiz has built a solid foundation for a run for the 2019 championship. “For Barber, its not a track where I usually feel really strong but last year we finished second and were on route for another strong finish before getting taken out,” said Ortiz. “So, with that I feel strong and have great teammates to work with this year so definitely looking forward to it. Robert Noaker’s run from 15th on the grid to the winner’s circle in the 2018 Mid-Ohio Sports Car Course Global Mazda MX-5 Cup race at all of 14 years old not only set a Guinness Book of World Record mark as a youngest winner of a professional race, it also set a precedent as a number of young racers have joined the MX-5 Cup field in 2019. Among them is 15-year old Tyler Gonzales (No. 57 Copeland Motorsports), who scored the Battery Tender Hard Charger Award in the second race at COTA (interview here: https://www.instagram.com/p/BvZhFcRA7Hz/). Another young racer to keep an eye on is Michael Carter, who at all of 16 years old has already won $100,000 in support from Mazda towards his racing career after winning the Mazda Road to 24 Shootout ahead of the 2019 season. 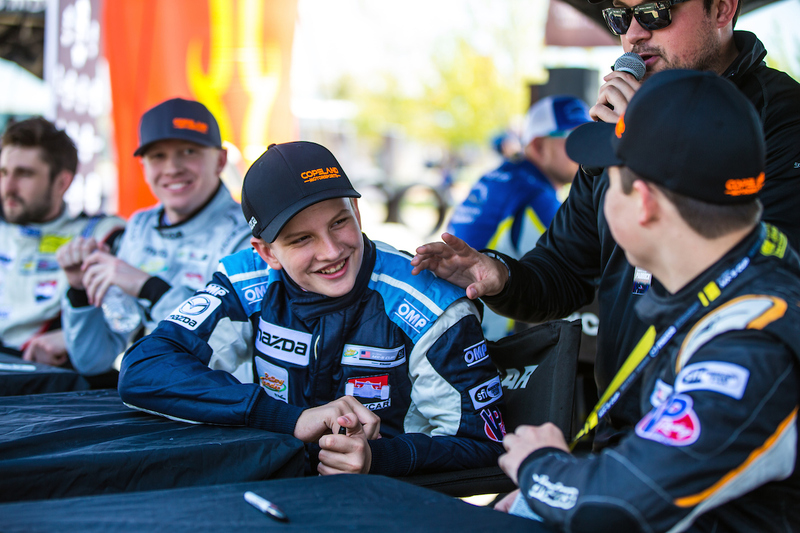 Carter took eighth and fifth in his first two races at the Global Mazda MX-5 Cup level, and will likely be a racer to keep an eye on again this weekend. Also on the youth roster is 14-year-old Tyler Maxson (No. 74 Copeland Motorsports), who has thrown his hat in the ring for Rookie of the Year honors. A new version of the Global Mazda MX-5 Cup car, now with the 181-horsepower, 7500 RPM SKYACTIV®-G 2.0-liter engine available in the Mazda MX-5 Miata, made its debut in the beginning of the 2019 season. With the introduction of the updated Miata, the Global Mazda MX-5 Cup series will now include a two-class structure. The ND-2 class utilizes the new, 181-horsepower version of the Global MX-5 Cup car, while the ND-1 class will feature the previous generation Global MX-5 Cup car. Robert Stout (No. 28 McCumbee McAleer Racing) has the Barber Motorsports Park race lap track record with a fast lap time of 1:41.1655-seconds, something that could be in peril this year as the higher-horsepower ND-2 machines take to the track. But, having qualified fourth at COTA, Stout could indeed be the one to set the new mark. The Rookie of the Year in the ND-2 class will receive a $75,000 scholarship from Mazda. The series continues to benefit from the support of title sponsor Battery Tender ® and presenting sponsor BFGoodrich Tires ®, both of which have renewed their support of the championship, while Andersen Promotions continues with its third season as the promoter of the series. Livestream on mazdamotorsports.com. Race 1 streaming will begin on Saturday at 12:45pm CT with Race 2 set for 5:25pm CT.